Preheat oven to 180 °C. Grease and line a loaf tin. Pour mixture into the prepared tin. Bake for 60 minutes or until an inserted skewer comes out cleanly. 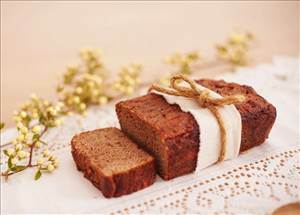 There are 189 calories in 1 serving of Banana & Date Bread. Calorie Breakdown: 32% fat, 54% carbs, 14% prot.